If it’s not made of gold, furniture recovered from the Titanic, or extraterrestrial materials salvaged from a meteor, you’ll need one heck of a gimmick to convince people to spend $30,000 on coffee table. 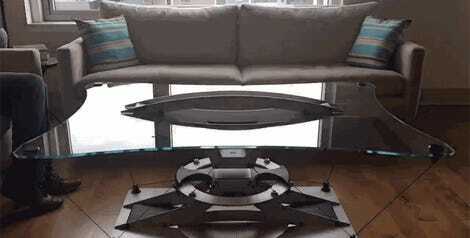 And that’s probably why Siren Design Studios made its Teles Taxídi table float like a hoverboard. 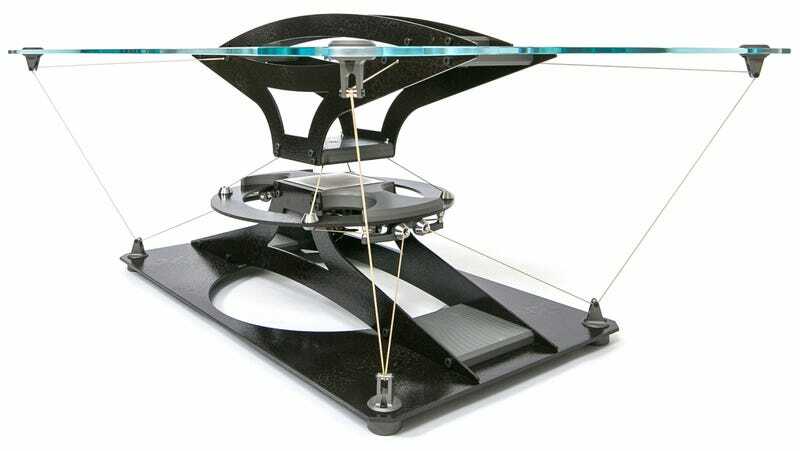 Like the hoverboard that Marty McFly rode in Back to the Future II, this table’s hovering abilities aren’t the result of some scientific breakthrough the government is secretly holding back. But instead of the wires and special effects used for the movie, the Teles Taxídi’s glass tabletop hovers two inches above its base using a giant pair of rare-earth magnets. The opposing force between the two magnets is strong enough to support books, actual coffee mugs, and resting your feet on the edge of the table. However, to prevent the upper portion from being launched across a room by the magnet in its base, and to keep it steady so that drinks don’t spill, the Teles Taxídi also features a series of support wires and pulleys that hold everything in alignment. But it still allows the glass tabletop to move so you can prove to guests that it is indeed floating and definitely worth the $30,000 you spent on it.